The Industry Standard. An economical cold pour crack filler rubberized for added flexibility. Recommended for cracks up to 1/2″ wide. Coverage is dependent upon depth and width of cracks. Typically, one gallon of Pourable Crack Filler will fill approximately 75-150 feet of cracks. Stir material thoroughly. 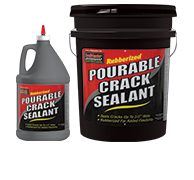 Pourable Crack Sealant is a ready-to-use material. Do not dilute. Pour Crack Sealant into cracks and squeegee flush to adjoining pavement. Allow material to dry before opening to traffic.